← Eat Any Houston Bugs Lately? Subterranean termites initially create their colonies underground. Termites are considered to be social insects and have a caste system. The queen termite is a massive egg laying machine. She never leaves the nest, is tended to by worker termites, and lays approximately 2,000 eggs each day report pest control companies in Houston . In addition to the queen and king, a termite colony has soldiers, workers, and winged reproductives (Also known as flying alates or “swarmers”). By the way, the swarmers look vastly different from the other members of the colony. Swarmers have black/brown bodies with wings and the other members are wingless with mostly white to white cream bodies. Left undisturbed, after a few years a termite colony will eventually become overcrowded. The overcrowding combined with warmer springtime weather as well as a warm rain shower triggers the winged reproductives to leave the nest in a mass exodus called “swarming”. When termites swarm, it’s not surprising that home or business owners often miss out on the spectacle as flights typically occur between 10:00 am and 3:00 pm when people are at work. The swarm of winged reproductives will leave the nest hoping to find a mate during their flight. Termites, however, are not good flyers so they do rely on the wind to carry them to their new destination. Thankfully, some termites won’t find mates, but many will. Once they do the new couple will drop to the ground, drop their wings and dig into the soil together. This will then be the site of a new termite nesting spot. Often times Houston residents find piles of dead reproductives next to their home, near a crack in a walkway or driveway, near a bush or tree stump, or below an exterior window sill. 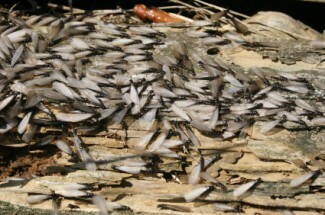 A pile of dead winged termites is a clear indication that a termite infestation is present nearby. Houston home or business owners may also find dead winged reproductives indoors. When swarming occurs indoors, termites will head towards the windows in an effort to make their way outdoors. Trapped indoors they dehydrate and die. But any swarming indoors is a clear indication that there is a termite colony with the destructive workers located within the wall, flooring, or other location. Although many folks have noticed evidence of termite swarmers before, they didn’t recognize them as termites at the time and may have thought they were just some type of flying ant or other bug. Save any suspect bugs that resemble termites for professional identification. Sometimes termites can be actively working indoors yet choose to swarm outdoors only. In these cases it means you will not have their swarming as a warning sign of termite infestation. Termites are considered to be the most destructive pest in the United States. Termite damage and treatment costs exceed $5 Billion each year. And the Houston area is a hot bed for termite activity. Termites are so dangerous because their activity is often hidden and can go undetected until substantial damage has been done. Termites can infest your home with no obvious signs of swarming. So getting your home or business inspected for termites at least once a year is a wise choice. The Houston termite control experts at Protex Pest Control can provide you peace of mind with a professional termite inspection. And if needed, provide a termite treatment for remediation or prevention and stop termites dead in their tracks.